Recorra lo mejor de la costa Dálmata en una escapada de un día desde Split. 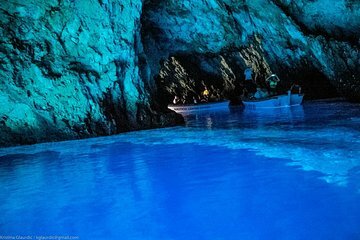 Visite lugares famosos como la playa Stiniva, la Cueva Azul y la Cueva Verde, la Laguna Azul y la ciudad de Hvar. Nade y bucee en un hermoso entorno natural; le proporcionamos el equipo de buceo. Pasas mucho tiempo en lancha y apenas puedes bañarte ni hacer snorkel ni nada de nada. Lo mejor, entre comillas, la visita a Hvar. No merece la pena. The tour was wonderful! The day was jam packed with amazing views, food, and swimming. I have 0 complaints and totally worth every penny! The tour was an awesome way to see some of the islands around Split. Some of the stops were shorter than desired and I have heard the Blue Cave is sometimes skipped because of choppy water. The boat seating is a bit obscure it that you site one person behind the other and could be viewed as uncomfortable by some, but we found it was fine for us. The captain and crew were great and had really good recommendations for the rest of our trip. this might not be the trip for you if you want a lot of time at some of these stops, but it was a good way to take in a lot of cool sights if you are trying to do a lot in one day while in Croatia. I enjoyed this tour a lot! The Blue Cave is extraordinary but smaller than I had expected. The speedboat tour was cool and I loved my single seat in the front of the boat. We unfortunately had to change the schedule because the sea got really rough and we couldn't make it to the Green Cave Blue Lagoon. So we went to another swimming location which was quite nice. Anyone who is prone to motion sickness make sure you take some medication before entering the boat! I don't recommend this tour to anyone with back issues! We got a little speed boat which was fun. Islands and blue lagoon was unreal. It's a good little day trip to do if you're in split. For the cost it was I thought the boat would be bigger but it was fun nonetheless. The time OCt 2017 we went was not at all suitable. The season was almost done. We couldn't snorkel or swim. Too cold. The trip is meant for relaxation. if that is what you are looking for. It is great. Speed boat has seats which don't have room for any flexibility. It is like sitting on horse for 1.5 hours. you cant practically get up or move because it is a speed boat and no room at all. Blue cave isn't that amazing a wonder and hence can be missed unless you have nothing to do. The trip is too expensive also. To talk about the crew, they were the sweetest people. Our guide and skipper were very warm and kind to us. Recommending us all that we could possibly do in Hvar. We were unfortunate to choose the wrong time for this tour. The meeting place was easy to find at the entrance to the castle We boarded a speedboat with saddles and were provided heavy jackets needed for the high speed ride to the islands. People of all ages were on board. They played great music as we sped across the water for nearly an hour. The water was too choppy so were weren't able to enter the blue caves. Instead we entered the monkey seal cave nearby, very cool. We then went to a privately owned island with a strange zoo turkey's and mules and snorkeled in the bay. The water was clear and warm about 72 degrees. We then went to an island that has no inhabitants, only 5 restaurants. We ate at a pricey spot, but very good food. We had the option to snorkel but we chose to explore on foot. We stopped on Vis for drinks and a walk - they're currently filming Mamma Mia II. We went to Hvar town and spent about 2 hours, walked 1/2 way up the hill - super steep steps but great views. Had wine and food in town then sped back to Split, arriving at about 5pm. We loved it! Would totally do this or something similar again. The islands are a must see! The islands are very far away from the main land so be prepare for a long ride. The first ride to the blue cave was more than one hour. But the Blue Cave was very interesting! Hvar was beautiful and the hike up to the fort was worth it although it may be a tough climb for the older folks. I can 100 recommend the tour. The skipper and the tour guide are so friendly, our guide was with us the whole day apart from the free time for sightseeing or swimming. The group is small, which makes the tour so-so friendly and relaxed. Our guide shared a lot of information with about the islands we were visiting including history background and some recent stories too. This was definitely the highlight of my holiday in Croatia. Pretty good in general. You must be ready that all these destinations is super touristic and there are too much tourists there. Blue lagoon is the best place in this tour, the rest is ok, but not something special.